Exploring the vast power of parallel computation on modern graphic cards, noumentalia.de created a “2 Million Pixel” experiment. This application maps a full HD (1920 x 1080 @ 30 fps) video source into 3D space. Each video frame is processed in realtime by a CUDA kernel. Each pixel in a frame is scaled in the z-axis by its luminance value. The application interacts with DirectShow.NET, CUDA.NET and SlimDX libraries. Thankfully, music artist and composer Ludwig Berger created a progressive soundtrack for the presentation of the experiment in a video: Watch and vote on YouTube. 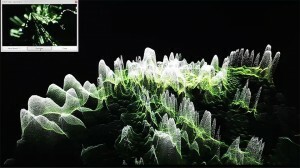 The 2 Million Pixel Experiment was featured in the NVIDIA CUDA Week in Review, Nov. 10, 2010. Visit the project domain visualcompute.com for further information.